This is part 2 of our 4 part Dogs Day of Summer series. Be sure and check out the other posts HERE. There are a bunch of different dog treats on the market. You can even find dog treats at the $1 store. Before you just pull a box of the shelf, you really should think about the ingredients in your dog treats. It is important to find healthy dog treats and making them all the time is not always realistic. So how do you know a treat is healthy for your dog? What ingredients to look for in a dog treat. 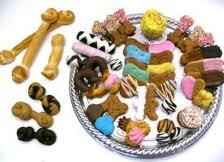 When choosing a dog treat, make sure it’s something your dog will like and something that’s appropriate to give a dog. When buying treats (and food) for dogs, it’s good to follow the same common-sense rules you’d use when shopping for your family. Look at the ingredients list. If the ingredients include things you don’t recognize or can’t pronounce, it might not be the best treat for your dog. Just because you like onions and garlic, these are not good for your dog and keep to dog and not human treats. Unfortunately your dog may be allergic to many foods we eat. Chloe recently taste tested CloudStar’s latest line of Dynamo Dog™ Functional Treats. If you have not heard of CloudStar they are a small, family oriented company, and for more than a decade have been baking all natural, low allergen treats right here in the USA. Check them out at www.cloudstar.com. Since Chloe can’t really provide any verbal feedback and she will basically eat anything we send her way I just wanted to comment on how nice it is to provide her treats that are doing more than giving her calories. 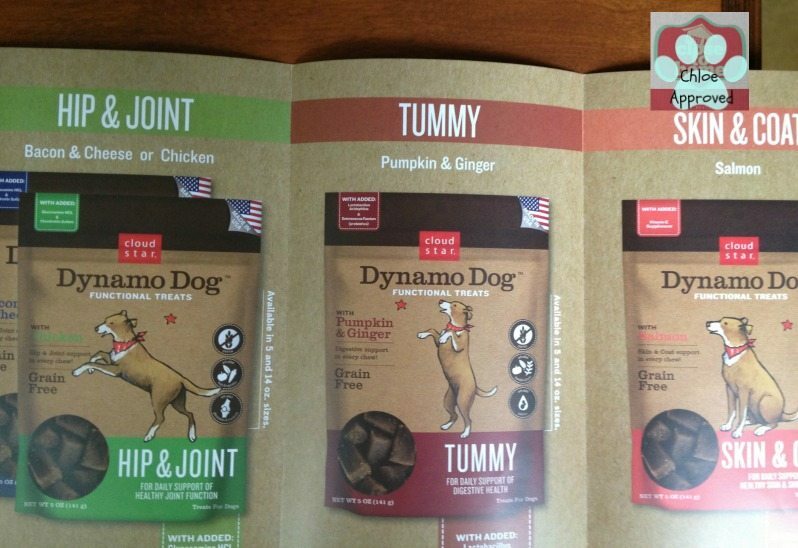 This new line of Dynamo Dog treats have many health factors like hip and join, tummy and skin and coat varieties in flavors I know my dog loves. These healthy dog treats are the perfect size for training too. They are not crunchy so the dogs can get them in one bite, at least Chloe can, and then move on to the next trick. Feel confident you are providing your dog will USA made snacks that are benefitting them from within. I also love the packaging as they are easy to pack if you are traveling with your dog or throw in your bag if you are taking them for a walk somewhere in public and need treats for dog training. 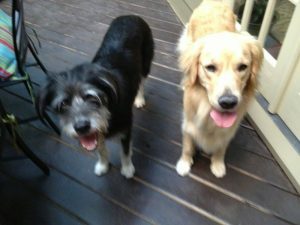 These dogs are ready for their Dynamo Dog Treats! SO be sure and WAG MORE BARK LESS and give your dog a treat that is flavorful and functional, check out Dynamo Dog Treats at a retailer near you or Amazon Also be sure and follow them on their Facebook Page for additional dog training tips. OK SIT, STAY and ENTER this giveaway for your DOG courtesy of CloudStar. One lucky reader will receive 4 bags of Dynamo Treats. Enter the Rafflecopter Below. Also check out Part 1 of Dog Days of Summer for another great giveaway! My pup loves her Kong Bubba and a cactus-shaped toy we bought from Petco for her! Something long lasting! Stuffed Kongs, bully sticks, knuckles, antlers. Frosty paws are Sissy’s favorite treat. I buy them when I have coupons or I make them myself. My pup’s favorite road trip treat is a peanut butter loaded Kong. My dogs love having rawhide chews in the car when we go on long trips. The other thing I like to do is fill their Kongs (for trips I usually mix some of their regular kibble with some canned dog food, stuff the Kongs, and freeze them overnight) so they have a couple of hours of busy time while I’m driving. They love the little bones! They love peanut butter flavored bones. Our Glacier loves her nylabones! Their chewy. Which is a sock with s knot tied in it. Pookie like the big Reindeer that squeeks ! Nickel is satisfied as long as he is close tome ! My dogs don’t go on road trips w/us, unfortunately. I give my dog Biljack treats, she loves them. Artie loves Frosty Paws and peanut butter dog biscuits. My dog’s favorite road trip treat is Rawhide bones.